Donald Tusk’s government has won a parliamentary vote of confidence sparked by a scandal over leaked tapes of Polish senior officials. 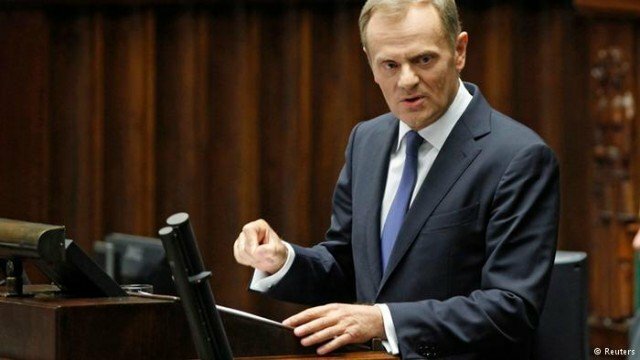 PM Donald Tusk had told parliament that without a pledge of majority support he would not be able to effectively represent Poland in the EU. The apparently secret recordings have been released by Wprost magazine. In one, Foreign Minister Radoslaw Sikorski allegedly says that Poland’s alliance with the US is worthless. In another, Central Bank head Marek Belka and Interior Minister Bartlomiej Sienkiewicz are apparently heard discussing how the bank could help the governing party win re-election in 2015; such action would be in violation of the bank’s independence. All have said their words were taken out of context and they deny any wrongdoing. Wprost said it obtained the recordings from a businessman. In Wednesday’s vote, Donald Tusk’s centre-right two-party coalition received backing from 237 lawmakers, with 203 against in the 460-member parliament. The prime minister needed a simple majority of 231 for the vote of confidence to pass. Donald Tusk had called for the vote before heading to the EU summit in Brussels later this week. The secret recordings were made over several months at locations including high-end Warsaw restaurants. In a speech to parliament earlier on Wednesday, Donald Tusk said he believed a criminal group was behind the recordings. Polish prosecutors say they have charged two people with illegally recording conversations and were questioning two more.